Act now to be part of South Brunswick’s most exclusive luxury estate community. 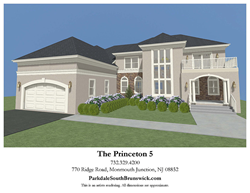 A rendering of the Princeton 5 model home that will be available October 2017 at Parkdale at South Brunswick. Parkdale at South Brunswick, a luxury estate community by developer Byron-Hill Homebuilders™, has recently announced the close out of the community, with only three homes remaining for purchase. Three home sites are available now, and one model home is currently under construction and will be available in October 2017. The Princeton 5 model home, currently under construction, features five bedrooms, four-and-a-half bathrooms, a two-story great room and an eastern facing front door. Additional upgrades include: A walk-out basement, interior wrought iron railing, custom paint colors, upgraded appliances, a gourmet kitchen, stained oak floors (first floor and second floor hallway), ample recessed lighting, upgraded plumbing and upgraded tile. “This really is a great opportunity for a family with school-aged children to move into a new home and be part of the prestigious South Brunswick School District,” said Gaita. Situated in South Brunswick, Parkdale is just steps away from South Brunswick’s nationally acclaimed high school, which is a recipient of the Blue Ribbon Award and was named “Star School” from the United States Department of Education with rankings in the State’s public school system. The community is also just six miles from Princeton University and a 20-minute drive to Rutgers University. Parkdale at South Brunswick is easily accessible from Route 1, Route 522, the New Jersey Turnpike and Route 130. The community is approximately eight minutes from Princeton, nearby major shopping centers, and prestigious medical facilities like Robert Wood Johnson Medical Center. Train service is also available to New York and Philadelphia from nearby Princeton or Monmouth Junction. To learn more about Parkdale at South Brunswick, please call 732-329-4200, visit the Sales Office at 770 Ridge Road, Monmouth Junction, NJ or visit http://www.ParkdaleSouthBrunswick.com.